Well, I just realized that this was my ELEVENTH Annette Marie book which I read AND absolutely adored. I think it’s definitely safe to call her my favorite author by now. I just can’t quite believe she isn’t more known and loved because these wonderful stories deserve so much recognition. Luckily, I am here and ready to rave about all things Annette Marie, but more specifically in this review, The Shadow Weave. The Shadow Weave is the sequel to The Night Realm and immediately picks up where The Nigjt Realm left off. Whereas the first book really set up the story and started everything off with a bang, this second story feels a bit slower, even if the stakes are still incredibly high. On the run, Clio and Lyre must find a way to get the Overworld, evade assasins and bounty hunters coming after them and recover an item that may mean the end of everything if it falls into the wrong hands. I say slower because plotwise it didn’t feel like a whole lot happened, but rest assured it was still filled with action and adventure and a whole lot of delicious character moments and set everything up for what is bound to be an explosive finale. The characters are once again one of the main reasons I love Annette Marie’s story so much. Though I already fell in love with these characters in the previous book (and I loved Lyre already from the Steel and Stone series), this second book really solidified that love and gave them a permanent spot in my heart. Both of them are such underdogs and I think that’s part of why I love them so. Clio is a nymph, which is a relatively peaceful daemon caste, plus we’ve gotten to know her as a sweet and somewhat clumsy girl. But boy is she lethal as can be when provoked! And Lyre is an incubus, which many believe to be a weak daemon caste because their powers lie in seduction, but though they don’t excel in physical strength, their powers are maybe even more intimidating and frightening than anything. And part of why I love Lyre is that he recognizes this and his own power haunts and frightens him, in that he doesn’t want to use it to hurt people, but will to save his life. On top of that he’s also quite the genius spell weaver and just so much more than the carefree onedimensional incubus he pretends to be. Once again this book was filled with great cameos from characters from the Steel and Stone series that I highly enjoyed. You don’t need to read that series first to be able to enjoy the Spell Weaver series, but I do feel like reading both will optimize your reading experience. In this book we see a young Piper and once again we meet Ash. We even finally get to see exactly how he learned that even Draconians are not immune to an incubus’s aphrodesia! Overall, I just adore this series. It reduces me to a swooning, smiling, raving fangirl and I wouldn’t want it any other way. 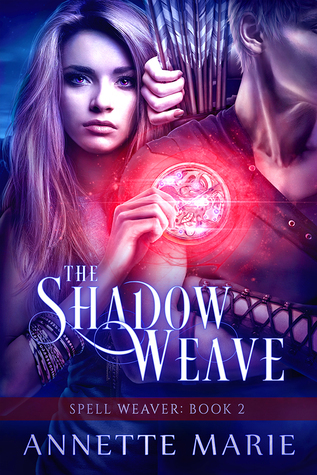 HAVE YOU READ THE Shadow Weave? WHAT DID YOU THINK ABOUT IT? I need to read this! I loved book 1! You’ve gotten me so curious about Annette Marie’s books. I’m sad that I don’t have any of her books yet. Yay, I’m glad to hear you’re curious about her 🙂 I do hope you’ll love her books if you decide to pick them up some day! Annette Marie is just the BEST. And I totally agree with you – where’s all the love for her books? Between us I’m sure we can help hype them up enough to get a few more readers, surely? I agree that Lyre and Clio are both such underdogs – I hadn’t thought about that much until now, but in saying that they are both incredibly deadly. I love that they are so innocuous but can bring it when they have to. I also fully agree that Annette Marie writes an INCREDIBLE romance. Wow. Haha, yeah between the two of us I’m sure we can be one of the best marketing channels Annette Marie has! It’s my mission to talk about her books as much as I possibly can 🙂 With every book I read by her, it just baffles me how these can be so unknown when they are THE BEST.